Ask A Baysprings MARKET EXPERT! DESCRIPTION PRICE REDUCED! ** BEAUTIFULLY APPOINTED, 5 Bedroom, Custom Built Home has approx $93,000 in Extras and Upgrades, a PRIVATE SIDE ENTRANCE to the PROFESSIONALLY DEVELOPED BASEMENT. This Gorgeous Home welcomes you with a Large Foyer that opens into an Flex Room/Dining Room, a STUNNING KITCHEN with EXPANSIVE WHITE CABINETRY with Pull-out Drawers in the Cabinets, GAS STOVE and BUILT IN OVEN, OVERSIZED ISLAND with extra storage and a Wine Fridge, GRANITE COUNTERTOPS, Lots of Potlights and gorgeous Glass Tiling on the backsplash. The Spacious Living Room has a BUILT IN WALL UNIT & Large Windows. The Beautiful Handscraped Hardwood Floor has a Cork Subfloor. The upper level Features a Bonus Room, Huge Master Bedroom w MASSIVE CLOSET, Spa-like Oasis 5 pc Ensuite, Upper Laundry, & 2 additional Bedrooms. The Lower Level has a Family Room, Wet Bar with Full Cabinetry, Island, Dishwasher & Full Fridge, 2 more Bedrooms, Carpet has a Cork underlay. Professionally Landscaped & in a Cul-de-sac. A MUST SEE!! Home for sale at 148 Baysprings Co Sw Airdrie, Alberts T4B 3X7. 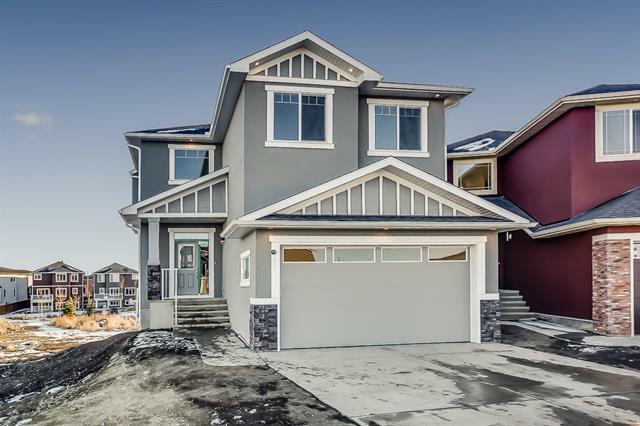 Description: The home at 148 Baysprings Co Sw Airdrie, Alberta T4B 3X7 with the MLS® Number C4233266 is currently listed at $595,000.